When we go to the hospital, we expect to get better – not worse! While the NHS do a fantastic job, there are cases where things go wrong. From misdiagnosis to mistakes during surgery, if you have been the victim of medical negligence, you deserve to be compensated. We have many years of experience in these types of cases and we can help you to get the compensation you deserve. What can be claimed for after NHS negligence? Can I make a claim on behalf of a member of family? Can I claim compensation from the NHS if my doctor misdiagnosed me? Can I claim compensation from the NHS if I suffered internal bleeding following an operation? Can I claim medical negligence compensation from my dentist? Can I sue the NHS after three years? What evidence do I need to make an NHS medical negligence claim? How much compensation will I get after NHS medical negligence? Why choose us as your claims service for NHS negligence claims? NHS medical negligence can happen at any time, be it a mistaken medicine prescription, a routine check-up, an incorrect surgery, an accident, or during the treatment of an illness. If you have been the victim of medical negligence, you will be entitled to compensation. In fact, the NHS has set up the NHS compensation scheme to cover claims-related expenses. We have helped many clients to get the compensation they deserve, and we are always dedicated to securing the highest NHS negligence payouts. In this guide, we have put together everything you need to know regarding such claims. This includes eligibility, how to make a claim for negligence, NHS compensation payouts 2015 – 2017, and the NHS negligence claims time limit. So, read on to find out everything you need to know, and if you have any queries, please do not hesitate to get in touch. You were not warned about the risks of a certain treatment. You did not consent to a treatment. You were given the wrong medication. You were the victim of a misdiagnosis. An NHS doctor failed to diagnosis your condition. There was a mistake made during an operation or procedure. NHS negligence claim payouts have risen considerable over the years, as you will see via the graph below. 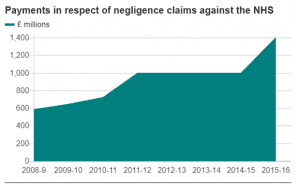 In 2008, the NHS paid out £538 million in clinical negligence compensation. This has risen to £1.4 billion. If you want to make a claim for NHS negligence, all you need to do is give us a call and we will handle it for you. When you ring us, we will start by providing a free consultancy session. This gives us both the opportunity to ask each other some questions. The reason we need to ask questions is simply so we can find out the facts about your case, enabling us to advise you in the best possible manner. We can also arrange a local medical for you if required. We handle all cases on a No Win No Fee basis, which is something we explain in further detail below. General damages – This is the compensation received for te pain and suffering you have experienced. Loss of earnings – You can also claim for loss of future earnings if you are going to be off work. Care claim – If you have needed help around the house while you recover, the person that has cared for you will be able to file a care claim. If a loved one has been the victim of medical negligence, and they are not able to make a claim for themselves, you will be able to do so on their behalf. Not only does this involve cases whereby the person’s injuries are so severe they cannot claim, but you can also claim on the behalf of a child under the age of 18 if you are their parent or guardian. In some cases, medical negligence can result in death. If someone you love has sustained fatal injuries because of negligence, you can make a compensation claim on their behalf. You can sue for a fatal accident on the behalf of the deceased if you are one of their family members or you are a dependant of the deceased, i.e. you relied on them financially. If this applies, you will be able to claim for funeral expenses, a bereavement award, medical expenses, punitive damages, and general damages. For more information on suing the NHS medical negligence for fatal injuries, please do not hesitate to get in touch. You may have come across a misdiagnosis compensation calculator online, but it is important to recognise that these only provide estimates, and so you should not take these figures as a guaranteed amount. If you have suffered internal bleeding after an operation, you will be able to make a claim for compensation so long as the NHS is to blame. 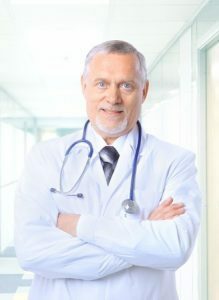 If the internal bleeding was an unforeseen complication that was not caused due to medical error, you may not have grounds to pursue your case further. However, if a mistake was made during the operation, it is extremely likely you will be entitled to compensation. For further information, please give us a call. You can claim for medical negligence compensation from your dentist. Common cases include the likes of misdiagnosis, an incorrect tooth being pulled out, and infections that were caused via dentist error. Of course, to make an NHS negligence claim, you must have seen an NHS dentist. If you haven’t, we will make a claim against the private dentist company instead. Successful claims against the NHS are made within three years of the incident occurring. In most cases, you will not be able to make a claim after three years, and please note that court proceedings do need to be issued within this time frame. There are some rare exceptions, however, and so it is worth getting in touch with us and we will discuss this further with you. If you were a child when the medical negligence occurred, you will then have three years from the date of your 18th birthday to make a claim if your parents did not claim on your behalf at the time. The NHS owed you a standard of care. This is usually simple to prove. After all, the medical professional will have agreed to take you on as a patient. The medical professional breached their duty of care, and this directly resulted in your suffering. Medication prescribed that the patient is knowingly allergic to. Medications being prescribed that should not be. Incorrect dosage period or amount. Wrong medication dispensed or prescribed. Infection caused by poor hygiene. Cosmetic surgery causing disfigurement and scarring. Foreign objects left in the body. The wrong body part being operated on. A condition is missed and ends up going undiagnosed. If your case does not fall into one of the categories mentioned above, don’t worry. Give us a call and we will be able to shed further light on your eligibility. One thing all of our clients want to know is how much compensation they will receive if they make a claim for medical negligence. Unfortunately, it is impossible to provide a definitive answer to this question. This is because every case involving clinical negligence is different to the next, and there are so many variables entailed. You may have come across a medical negligence claims calculator online. There are a lot of these calculators popping up, but it is important to note that they only provide estimates. In the table below, we have put together the typical payout amounts for injuries relating to medical negligence claims. While these are just average payout amounts, they can give you a rough idea of what you may receive. If you cannot find the injury you have sustained in the table, please do not hesitate to give us a call and we will provide further guidance. Loss of anticipated earnings £10,000 - £400,000 This is based on your future earning prospects as well as your current pay grade. There is the potential for a higher maximum payout in some cases. Loss of benefits £5,000 - £500,000 This is based on the actual income you have lost. There is the potential for a higher maximum payout in some cases. Pain and suffering £1,000 - £200,000 The level of pain and suffering you have encountered will determine how much compensation you will receive. Funeral costs £3,000 - £10,000 There is the potential for a higher maximum payout in some cases. Death – full awareness £15,950 - £18,100 Severe lung damage or burns that results in serious pain, followed by unconsciousness three hours after, and then death within a couple of weeks. Could also refer to very severe orthopaedic injuries or extensive chest injuries, which result in eventual death due to complications. Death – immediate unconsciousness £6,400 Death when there is immediate unconsciousness after injury, and then six weeks after, death. Death – immediate unconsciousness £1,050 - £2,125 Immediate unconsciousness followed by death within a week. Bowels Up to £140,000 Cases that involve incontinence, typically complete loss of urinary control and function and natural bowel function loss. Above-knee amputation of one leg £79,700 - £104,500 The award will depend on a number of different factors, including the success of any prosthetics, the severity of any pain, and associated psychological problems. Below-knee amputation of one leg £74,475 - £101,075 At the bottom of the payout bracket are cases involving a straightforward amputation with no complications. At the top of the range, we have cases involving a traumatic amputation, which tends to be the case when medical negligence has occurred. Severe psychological damage £41,675 - £88,000 In such cases, the prognosis will be very poor. There will also be marked issues with regards to how the injury has impacted the person’s life, including their work life, daily life, and relationships, as well as future vulnerability. Moderately severe psychological damage £14,500 - £41,675 There will be some similarities with the cases mentioned above. However, the prognosis will be better. Moderate psychological damage £4,450 - £14,500 In such cases, there may be some of the problems mentioned in the severe bracket. However, there will be significant improvements by the time of the trial. Less severe psychological damage £1,170 - £4,450 The period of disability and the extent to which sleep has been impacted will largely determine the payout. When you work with us, you can have the complete peace of mind that all of our solicitors work on a No Win No Fee basis. This means that anyone is able to make a claim, irrespective of what their current financial standing is. This is because you are only going to need to pay legal fees if we manage to secure compensation for you. If, for some reason, your case does not go as planned, you will not need to pay a penny. If you were to go for a company whereby they charge per hour, instead of on a No Win No Fee basis, there would always be the risk that you would have a massive legal bill yet no compensation to fund it with, and so you would be at a loss. This could also result in the solicitor merely taking on your case to take your money, as they are not impacted by the outcome of the case. This is a risk that is too big for most people, and we completely understand why, which is why we work to a No Win No Fee payment structure. You can have complete peace of mind regarding your finances, and you know that we will never waste your time – we will only take on a case if it has a genuine chance of compensation. There are many reasons why you should choose us as your claims service for your claim against the NHS. This includes the fact that we have an excellent record of making successful claims against the NHS. This is an area that we have a lot of experience in and you only need to look at the feedback we have received from previous clients to see that we have an outstanding reputation in the industry. One of the main reasons for this is that we always put our clients first. We recognise that you are going through an incredibly difficult period at the moment, which is why we will work as hard as we can to secure the highest possible NHS negligence payouts for our clients. We aim to do this in the smoothest and most efficient manner, enabling you to concentrate on your recovery while we work in the background on your case. Of course, if you do need us for any reason, we are only ever a phone call away and we are always happy to help and take your questions. If you want to make a claim for NHS medical negligence, all you need to do is give us a call on 0800 073 8804. You will speak to one of our polite and professional advisors, who will happily answer any of the queries you have, be it about NHS compensation payouts 2016 – 2017, suing the NHS time limit constraints, or anything else. If you are ready to get started, they will put you in touch with one of our in-house No Win No Fee solicitors. We will always match you to the best solicitor based on how your case matches up with their experience. So, what are you waiting for? Give us a call today. This link takes you to the Citizens Advice website, where you will find information on taking legal action against the NHS for clinical negligence. This link is helpful because it provides advice on NHS hospital complaints, including what you might want to complaint about and what you should do if a relative has died because of a medical accident. This takes you to our guide on medical negligence claims, which contains information on the different types of medical negligence claims, time limits, how to make a claim, and much more. This link takes you to our guide on misdiagnosis claims, which includes details on the types of clinical negligence, why medical misdiagnoses occur, and who misdiagnosis claims are filed against. This link takes you to the NHS page on how to make a complaint about an NHS service, including the NHS complaints procedure compensation, time limits and what you should do first.